Season is back in full swing in the Coachella Valley, the winter residents have returned, and there’s no lack of activities to keep you busy during the day in this beautiful desert. Once the sun goes down, there’s much to choose from as well. With a lively music scene and so much delicious cuisine, nightlife in the valley is more exciting than ever. Indian Wells Golf Resort has a social experience, Shots In the Night, that combines the best activities the desert has to offer into one fun-filled night out with friends. 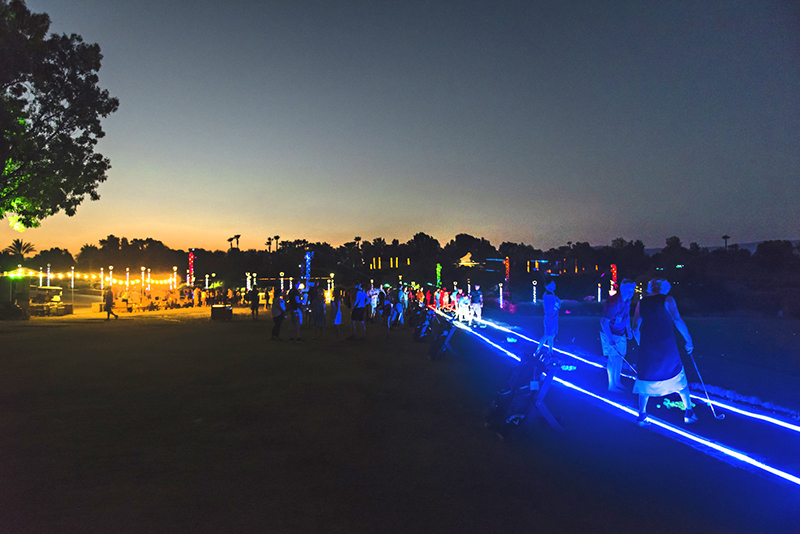 Shots In the Night combines golf, food and drink, music, and fun on a beautiful property and is the first golf entertainment amenity of its kind in the Coachella Valley. 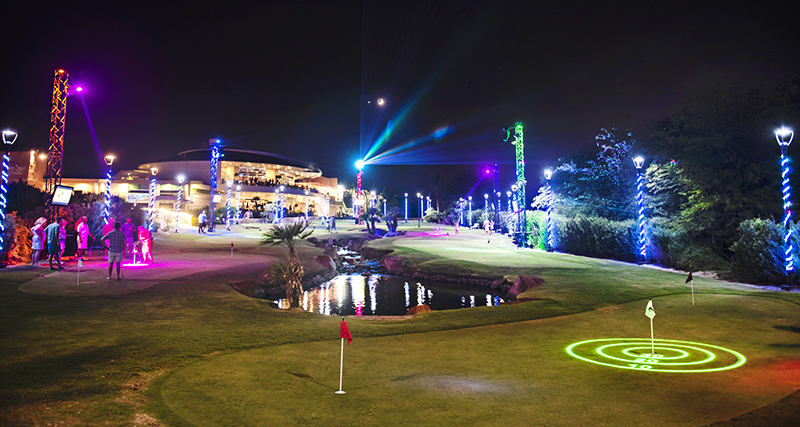 This Top Golf-style experience offers a variety of games participants can play. 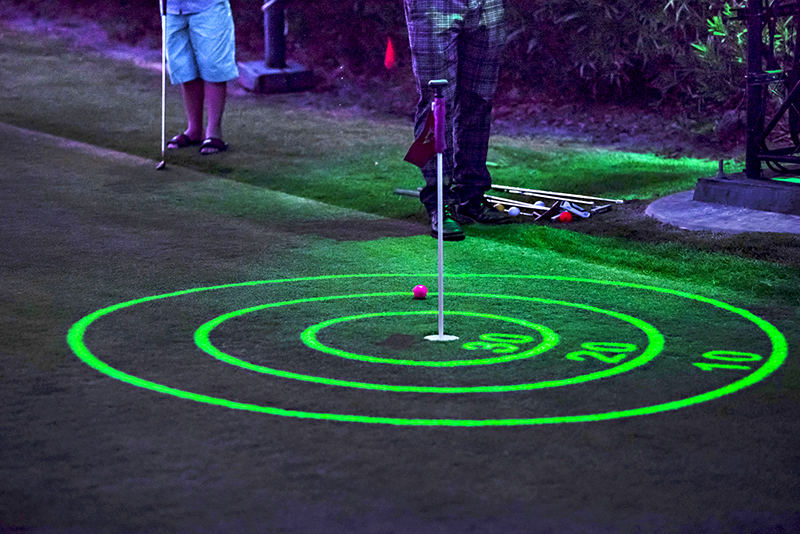 Perfect for both groups and individuals, the driving range has large, colorful targets that light up and make noises when you hit them. The nine-hole putting course has computer-generated lasers that will project games like horse, golf darts, and bocce onto the green. For only $40 an hour, up to six people can book a stall or green to play under the stars, with seven greens and twelve hitting cages, accommodating many groups. However, due to popularity, it’s still wise to make a reservation. Hotel package guests playing golf are able to book a year in advance. Hotel guests have access two weeks in advance and the general public can book one week in advance. Reservations are only for the first hour of each night, so when a group is having a great time and wants to extend their rental, they won’t have to leave due to other reservations waiting. To reserve, interested parties can go online to book or call. For those who decide their night plans on the fly – no worries. If no green or hitting cage is available, there is a waiting list which people can call and be added to before they even arrive. Guests check in at the back of the clubhouse, where they’ll be told how long their wait will be. The wait can be part of the fun, as while they’re waiting they can order great food and drink, listen to music, and can go up to Vue Grille and Bar to wait at the bar with a restaurant pager. 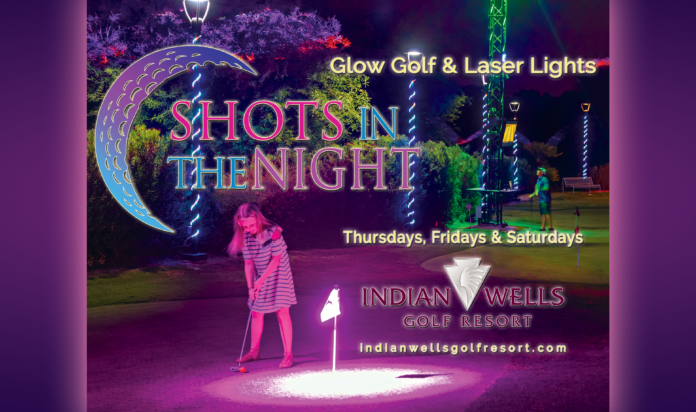 Whether you’re a scratch golfer or a novice, the Shots In the Night experience is fun for all. It doesn’t require the same time commitment as a round of golf and is welcoming and accommodating to all skill levels. Said Matt Balestreri, Director of Night Golf at Indian Wells Golf Resort, “I have personally played numerous games with all levels of golfers and adjusted the level to beginner, intermediate, and expert, and it was incredibly fun and competitive for all.” The targets on the driving range will vary from 40 to 150 yards, giving golfers of all levels a chance to enjoy themselves. As delicious as it is fun, the experience also features the introduction of the Indian Wells Food Truck, which serves breakfast, lunch, and a special evening menu. Players can enjoy such tasty dishes as short rib grilled cheese and ahi poke cones and will have a large selection of beer, wine and liquor to wash it down with. This food truck addition, new to Indian Wells Golf Resort this fall, provides golfers with such delicious foodie fare as acai bowls, chicken and waffle cones, and bacon jalapeño mac & cheese as well as specialty cocktails served in glow cups. For less adventurous eaters, the truck has classic items such as burgers and hot dogs. Grab five of your favorite friends and head to Indian Wells Golf Resort, located at 44500 Indian Wells Lane in Indian Wells, and get ready for a night of golf, drinks and food, music, and fun! As Director of Sales and Marketing, Michael Tebbetts, says, “As the center of our ‘campus’ with four hotels, we’re always looking for fun things for visitors to do during off-peak hours. There are a lot of golf simulators out there, but I haven’t seen anything in a setting like this – outdoors and on a real putting green. We’re looking forward to providing this opportunity to our guests.” Private parties can be booked by contacting Syndee Tucker, the Event Sales Manager, at (760) 834-3831 or stucker@iwgr.com.